all this happiness: Scowling at Winter. I hate to be so typical, but man, I have spring fever quite bad. Lots of us do it seems. We're very short with winter this year, and the internet is no help--it's very hard for me not to throw a fit and be depressed for hours after reading all manner of spectacular blog posts from places where it is warm. Blast winter! I live in a place where it seems like it's winter most of the time, where we all know we're not in the clear until at least April. At the moment I keep turning around and glaring at the window as though if I looked at it hard enough, it would be just kidding. I've never had the winter blues so bad! Normally I can't wait for summer to end, I dread those hot sticky days, deflating hair and my crispy skin, freckles, the suffocating heat. But of course right now it's all I want, or at least I want mild days where bare arms are acceptable. I've stopped buying winter clothes and have started stockpiling summer dresses like a little clothes-obsessed pack-rat. For now though, it's all sweaters and tip-toeing around puddles of freezing cold slush. I'm also back on a vintage kick. I find that I go through cycles with it. I always love it, but sometimes going through etsy or rummaging through a thrift or vintage store is the last thing I can stand to do. Then, a few weeks later, it's all I ever want to do. I love scrounging around and finding old things, wasting away in front of etsy until I think I might have seen every single dress there. I've been vintage shopping like mad. Lots of summer things, like the most adorable pink dress that does not fit, blouses, dresses, aprons. The blouse above is something I bought at the end of the summer last year and totally forgot about. It's completely divine. I feel like it looks sort of nefarious, like little horns or something. In a drama set in the 50s or 60s at a college, this is the blouse that the catty girl in literature class wears. Or something. I bought it with a 40s crepe dress in pretty sad condition, but the lovely woman selling them let me tote both away happily for $12! I've been trying to salvage the dress, and it's not too bad except I think someone tried to wash it once, because it's really, really, really short. Oh well. My my you have returned! It's been a while since you posted, I was craving one of your lovely posts. I know how you feel about winter, it's such a blizardous day and I can't think of anything else but summer. Oh I can't wait till the trees bloom some green again! I'll have so many thigs to do then. spring fever has hit hard this year for me also. I have been mending all my old summer clothing and scouring for new additions. just for the principle of it, I have even been leaving the house in spring jackets pretending that it is a cool spring day rather than a slightly sunny winter day. the collar on that blouse is just divine! I'm soooo with you on being finished with winter. 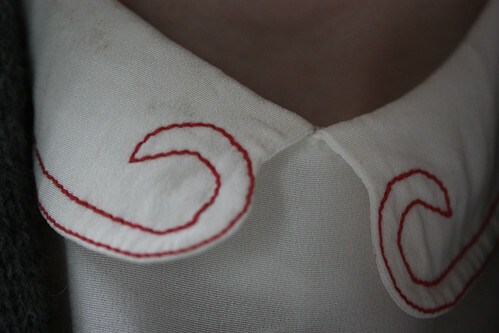 The collar of that blouse is divine, it makes me think of Pan's Labyrinth, or Snow White in a somewhat sinister way. Lovely! you just keep stock piling those pretty, warm weather clothes and it'll be April before you know it! My whole entire life living in New England I truly came to believe that February is the worst time of the year. But, once March rolls around there will be those freak warm(er) days in between the cold slushy days when you might be able to skip a few layers! That blouse is in fact the coolest thing ever. I'm putting the picture of that collar into my inspiration file...if I ever find a blouse with a sweet little collar like that, I might have to stitch some horns onto it! i love your blouse! i too have spring fever ... and unfortunately we have snow for days around these parts! It is a little wicked looking ;) I'm the total opposite, it's been hot all week and I'm going out to buy woolen things tomorrow, can't wait! I love that collar sooo much! Fortunately, winter here has been pretty mild, but spring always brings a psychological boost regardless. Definitely looking forward to more sunshine. trust me, I hear you! "I've stopped buying winter clothes and have started stockpiling summer dresses like a little clothes-obsessed pack-rat." I've been doing the same! I'm very into shorts this year. I can't wait to peel off the layers and allow my arms to greet the fresh air. Over-sized t-shirts and denim shorts is how I hope to play it this season. That shirt is adorable, just the right amount of detail! I'm on the look-out for a perfect off white blouse. No luck this far. Holy moley, tell me about it, girl. There's about 12 dresses from Urban and Am Appy that I want, but a) this town is expensive and b) I'd have to go into either one of those stories (eww). I'm coming to Albany from the 12-22, I think, and we should hang out. Hit up Liberty at Target on the 14th, etc. It'll be great. I've never seen a collar sewn like that before. It's pretty, lovely find! that collar is AMAZING! so pretty. i really, really want spring and summer to be here too. the days are getting longer and i know it's just round the corner..but it still isn't here. the anticipation is killing me! Spring is almost here! Unfortunately, I'm going on a school trip to somewhere cold/snowy/wet for a week soon. As for spring/vintage clothes, we don't have thrift stores here, so all the vintage/antique stuff I can find is from the flea market. could that collar be any cuter? no it couldn't be. the collar on that blouse is so sweet! thanks for sharing. I'm with on you on the spring fever too. the collar os so cute! Oi... I have the winter blues too. Living in Colorado... there is little hope of a day above 60 until May! Luckily, your style doesn't show a bit of lamenting... what a cute vintage look you have! I can't wait to see your picks for spring. Even the cherry blossoms are out in full-swing. But enough about that, let's bring on April anyway! Having an ETSY Giveaway on my blog with multiple prizes - all are welcome to enter!!! pretty! i've been gearing up for spring too! 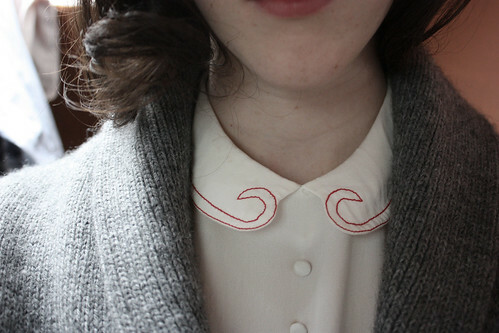 That collar detail is amazing, such a great idea! I will deffinitelly try to use it. isn't the world funny? it's almost always summer here and i hate it. i love the few months of 'cold' we get in winter. would you rather have 30-45 degrees (celcius) every single day for 6 months? I love the collar detail on this blouse! So nice! My, My, My, you have been busy... I really enjoy reading your posts, and I adore all the beautilful things you always seem to find. Thanks for all of the lovely vintage items you share with the rest of us all. And, I hope to eventually get up a few of the things I have, but seem never to be able to find the time. love love love that peter pan collar!